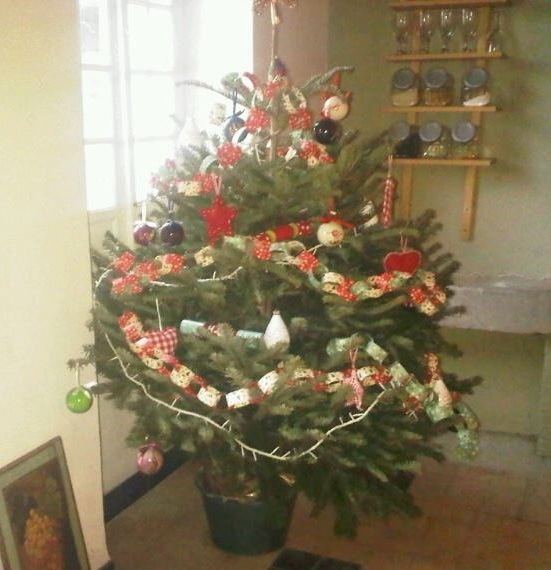 Probably one of the best things I have ever done is spend that first Christmas in our French house. Freezing cold? Yes. No Christmas Downton? Sadly. Hand picked baubles from The White Company? Nope. Instead we had a goose with its head and gubbins still in place, a tree decorated with paper chains and some borrowed flashing fairy lights from serge. And we had Pere Noel. And he came, he came! I LOVE Christmas. Always have. Family Christmas for me has always been a special day of eating, game playing, Xmas TV watching and more eating. My grandad would rally us all into a game which involved kneeling on a chair an throwing cards into his upturned, felt, trilby hat which always had a thick layer of Brylcream on the inner rim that was residue from his heavily brylcreamed hair. I think you scored points for getting the cards on the brim, in the hat or on a newspaper the hat was placed on. Sadly I can’t remember exactly. Which is one of the problems with family traditions – you’ve got to keep them going. My grandad died almost thirty years ago and I don’t think we played the trilby game ever again without him so now I can’t remember it. 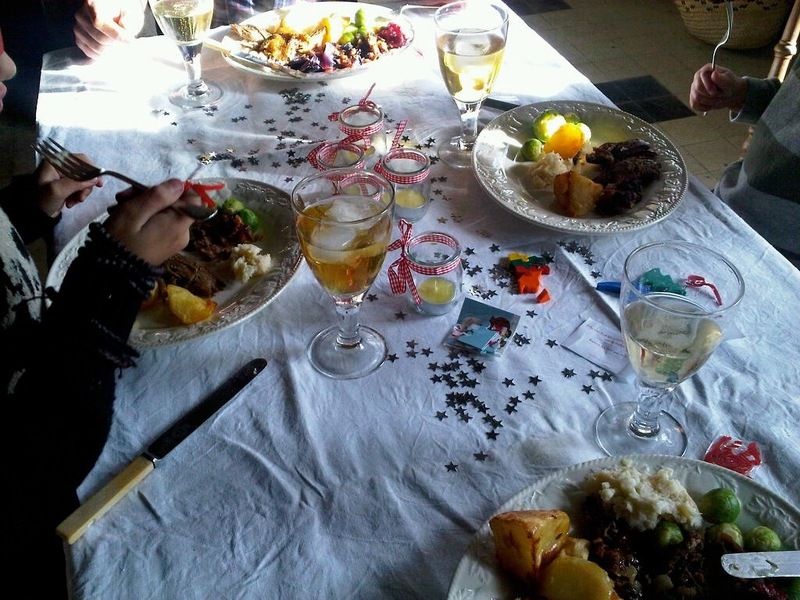 So you make new traditions – and for us, the winter of 2011 meant all new FRENCH Christmas traditions. Starting with Lucy, our goose. 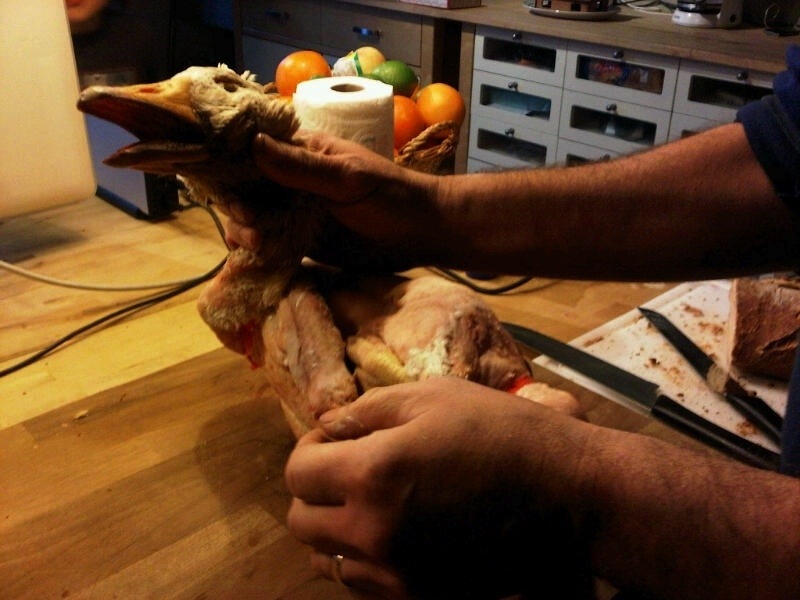 At home we always had turkey despite Peters pleas for goose for the best part of a decade. please note our 7 letter words! I wasn’t sure I’d like it. My father with his limited food palette was absolutely sure he wouldn’t like it, and besides we ALWAYS have turkey I argued. So Peter was overruled. Until this year. My parents had decided it was too far and would be too cold (they were right) so elected to stay home which meant I was the lone voice of dissent against the goose. Peter’s gain was Lucy’s loss. As I had to work all the way up to Xmas eve, Peter and the boys went on ahead and I did the very civilised London to Pau flight from City Airport later on. This meant it was up to them to ‘get everything ready’….. A goose was bought from Leclerc and a tree procured with some help from Serge. The boys made paper chains to put on it and by the time I arrived there wasn’t much to do except get into a onsie (no photos!) 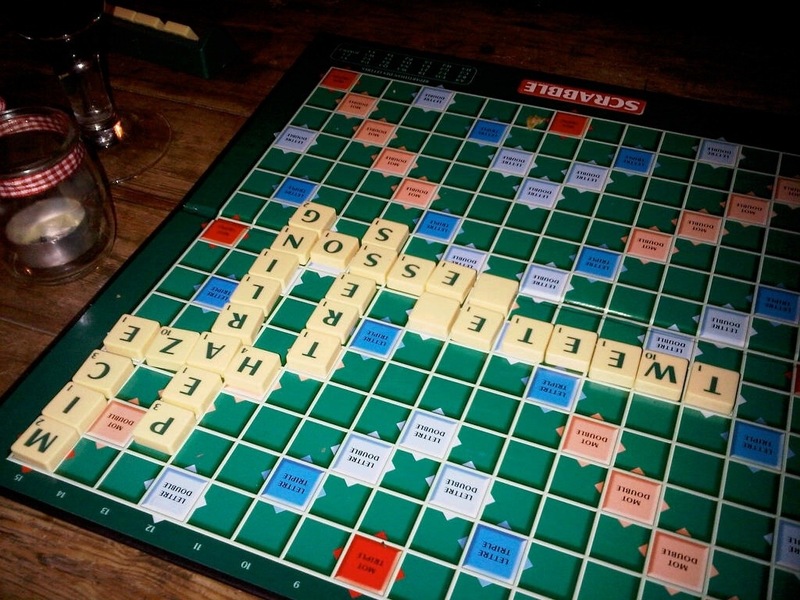 and sit in front of the fire with our trusty scrabble board. 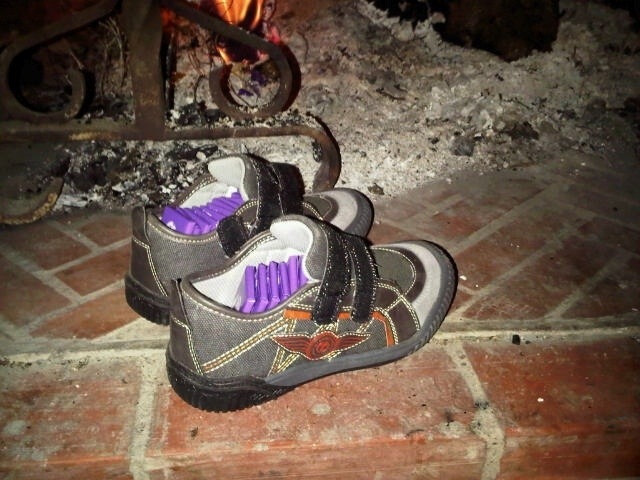 In France children leave their shoes out for Pere Noel to fill with chocolates. They also eat chocolate logs. In fact it is small miracle that French children aren’t all enormous given the vast array of chocolate options open to them. Some mornings I wake to find my kids eating pain chocolat, drinking chocolat chaud and about to top it all up with some bread and Nutella. If we lived here permanently I would have to treat chocolate with same strict quota rules I have I place for playing Minecraft. 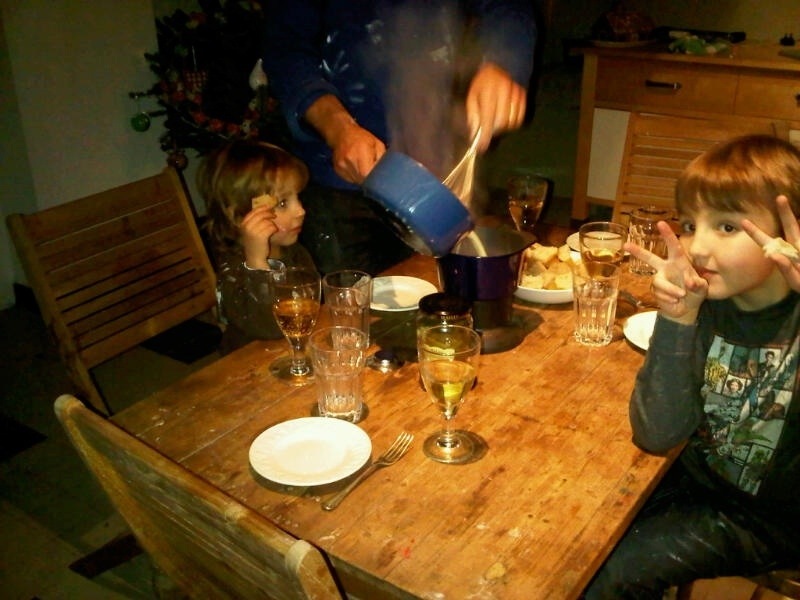 And on Christmas Eve we made fondu and I added too much kirsch and the children said it tasted like ‘wine’ (let’s not phone Esther rant zen to report the fact my kids seem to know what wine tastes like – I’m guessing they recognise the smell) but I declared fondu and all it’s stomach filling, artery hardening properties a new White family christmas tradition. yes we fon – DO! I once read that children like traditions. They love it when as a family you do the same thing every year. Like my Grandad and his trilby. 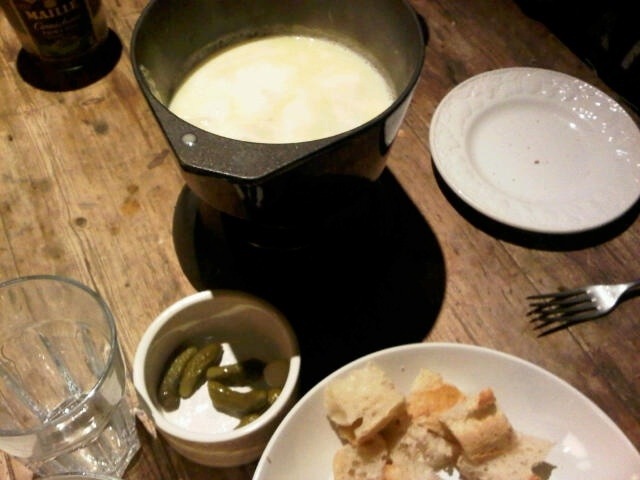 Well so it shall be with fondu even though no one seems to like it but me. And in years to come we even inflict it upon guests who don’t like it. I care not because ITS TRADITION! And Pere Noel came. And he had had presence of mind to get English books like a Lego annual not in French. And he filled the shoes with chocolate (cos we needed a bit MORE chocolate) and he filled the Christmas sacks with presents. 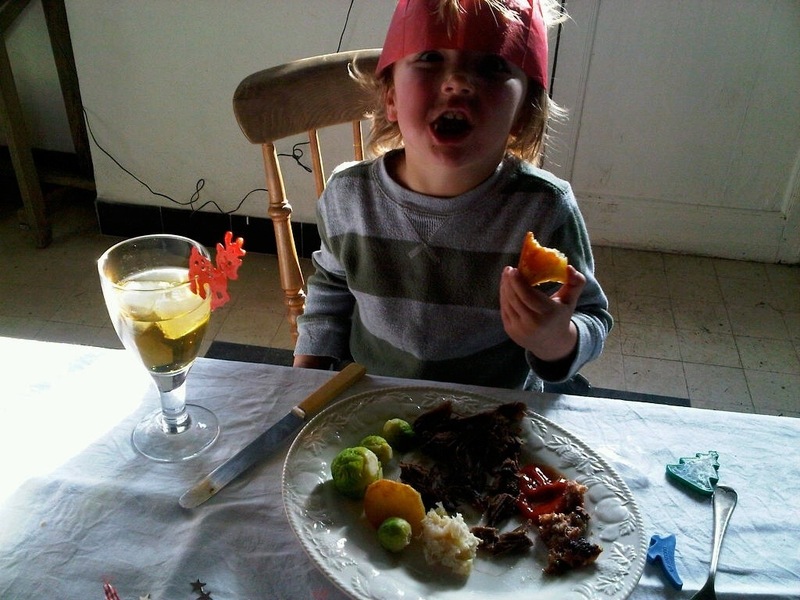 And Lucy was cooked the night before and reheated on Christmas Day (Jamie Oliver’s best day ahead goose recipe) and we all loved it. Even me. 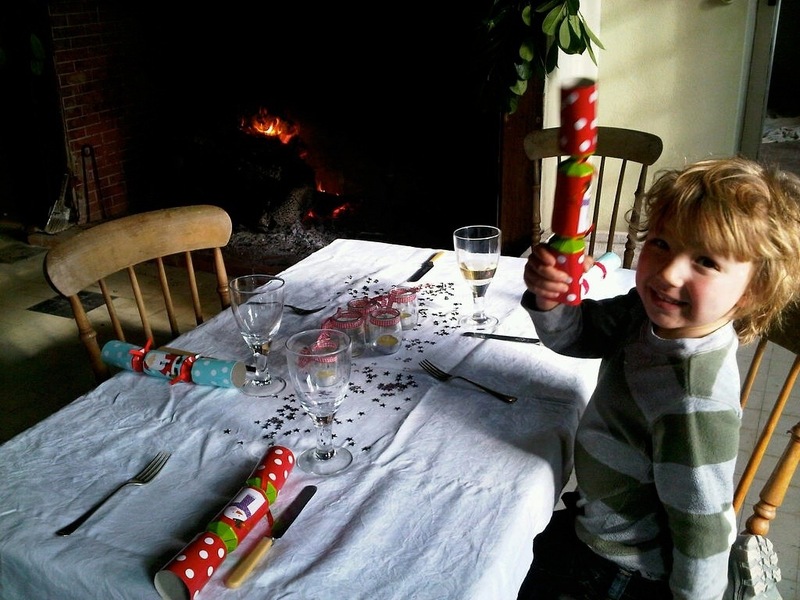 And we huddled around our tiny table in the kitchen (the only warm room) and we pulled crackers brought from England and put on silly paper hats. Sebastian even ate a sprout. A tradition he was not keen to continue but which we have made an annual ‘I’m a celebrity get me out of here bush tucker trial’ style experience. Is that green stuff on my plate??? And there was no pressure to even get out of our pyjamas (tho we did) and there was no timetable. if we wanted to eat at 4 o’clock or 9 o’clock we could. And once we’d packed the children off to bed we got the scrabble set out again and didnt even mind that we were missing Christmas Day Corrie (well I minded a bit but I’d sky plused it back home anyway) And we wished it could be Christmas every day. Just like this one. 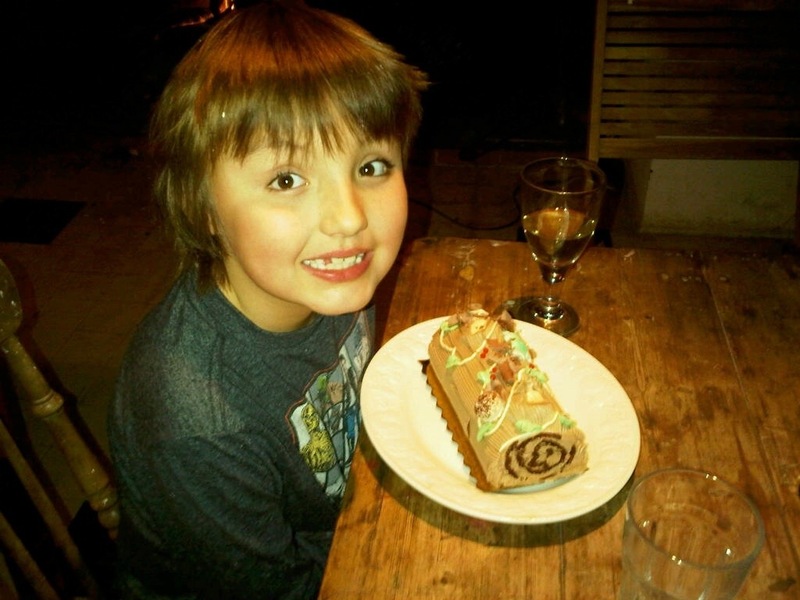 This entry was posted in Uncategorized and tagged christmas goose, Christmas in France, fondu, leclerc, Pere Noel by vicawhite. Bookmark the permalink. Looks a wonderful Christmas, and I spy cracker hats so it’s still got that Christmas vibe.